For demonstrating longitudinal and transverse motion. Consisting of a number of centric aluminium discs supporting series of metal rods, joined to a handle. On revolving the handle simulation of waves can be obtained on rods running in metal guide. Wave Motion ApparatusFor demonstrating the movement of progressive transverse waves. It consists of 18 aluminum discs supporting a series of iron nickel rods. On revolving the handle the motion is transmitted successively from one rod to the next, appearing as a wave traveling to the top and back. The movement of the waves can be observed. All metal parts are fitted on a superior quality polished wooden board. For demonstrating longitudinal and transverse motion. Consisting of 18 acentric aluminium discs supporting a series of metal rods. On revolving the handle, transverse waves are obtained with bent. Straight rods, complete on wooden box. We are offering a wide assortment of Wave Motion Apparatus which is ideally used for demonstrating longitudinal & transverse motion. 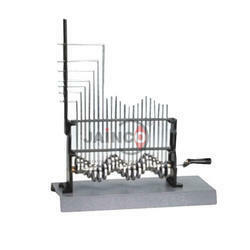 It consists of 18 eccentric discs supporting a series of metal rods. On revolving the handle, transverse waves are obtained with bent. They are straight rods and complete on wooden base. Glass Agencies are manufacturer of Wave motion Apparatus under EROSE Brand. 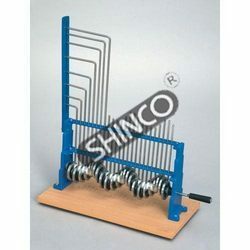 In order to fulfil the diverse needs of our clients, we are manufacturing a qualitative array of Wave Motion Apparatus. 'CSI' for demonstration longitudinal and transverse waves. Superior quality. Completely made of plastic with basic design and functionality similar to Cat. No. 7430. The plastic highlighted tips provide easy observation of wave motion. The rotating handle is fitted with a circular scale marked in degrees to indicate the rotation. Wave Motion Apparatus Powell's is used for demonstrating the movement of progressive transverse waves. The Wave Motion Apparatus comprises of small balls fitted on a wire rods, with eccentric motion attachment, driving handle and is fitted on a metal base. For demonstrating the movement of progressive transverse waves. Comprises a number of circular discs mounted equidistant from each others on a horizontal shaft in gradually varying degrees of eccentricity, with each disc having a vertical rod of same length supported on top and sliding up and down into a pair of guides. Complete assembly mounted on a wooden base. Here number of balls fixed in a tensioned strip. Apply a twist to the strip using the Lever and see the motion of the balls. Demonstrates all the properties of wave motion, when the shadow of the rotating drum is caught on the wall with the help of a incandescent bulb. · a sinusoidal wave or a transverse wave. · The crests and troughs of a wave. · The phase difference between different particles of the medium during wave motion.